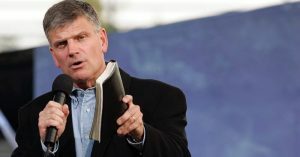 Franklin Graham, Abortions and his Spinning of the Truth! You are here: Home / Christian Talk / Franklin Graham, Abortions and his Spinning of the Truth! (ThyBlackMan.com) There is nothing wrong with the truth, especially when it is explained comprehensively. However, the problem with many people is, they traffic in selective truths in which they believe and choose to advance. This is true, when it comes to Franklin Graham, the son of Rev. Billy Graham, and his ministry. Mr. Graham is a major supporter of President Trump and his administration. Keep in mind, the Lord our God NEVER traffics in lies to achieve any of His objectives. Yet, Mr. Graham and his followers will have us believe, the ways and nature of the Lord, have somehow changed with the election of Donald Trump to the presidency of the United States; essentially saying, its okay to traffic in lies as the end results justify the means. Additionally, the book of Proverbs states this and it is notable. Do you know of anyone who might fit the above descriptions? If you said, Mr. Trump, you would not be wrong or far off the mark. People like Mr. Graham, President Donald Trump, Vice President Mike Pence, Attorney General Jeff Sessions, so called conservative judges and others, persuasive powers, when it comes to religion, flow in part from, convincing their followers they are religious and are students of Jesus Christ, because of their political position, when it comes to the issue of abortions. So, let’s hash out the issue of abortions from a Biblical stand point. You may go to your Bible and verify, what is about to follow. There is no intent to spin this issue. The abortion issue has been politicized, by the Republican Party for their own nefarious gains. They have advanced a misinformation campaign, when it comes to the scripture of the Holy Bible and a woman’s right to choose, when it comes to her body. The Republican Party, along with Mr. Graham and so called “evangelicals,” have misquoted scripture, which itself is a sin. Roe vs Wade, the decision by the Supreme Court, simply gives women the right to choose, whether they will follow God’s edict, when it comes to the issue of aborting a fetus. That’s no different, then you as a person having the choice to sin or not to sin. However, God tells everyone, if you make the choice, that is not in keeping with His commandments, you can expect to be punished for your sinful behavior. See Deuteronomy, the 28th chapter, starting at the 15th verse. Here is what the Holy Bible clearly and unambiguously states, when it comes to a woman’s right to choose and notice, these scriptures do not differentiate, in regard to men or women. The scriptures apply to both, men and women. Go to the text, and see for yourself. The verses do not say, only men have the right to choose! So you clearly see, that God, does not take from a woman and anybody else, the ability to choose, when it comes to walking in His ways and following His commandments, statues, and judgments. The propaganda, that Mr. Graham and the Republican Party promotes and has ingrained in the minds of non-readers of and those who do not study scripture, is that the Lord our God, in some manner, has taken away the right to choose from women. And that, is just not true. There is no scripture in the Holy Bible that supports, that notion. The verses do not exist. The simple point, being made here, is that women, just like men, according to the Bible, have the God given right, to choose, whether they indulge in sin or follow the teachings of Jesus Christ. Of course, abortion is a sin, and any woman who chooses that sin, is guilty of violating, the commandment to multiply life. Given that; a deterrent to women, considering an abortion, is an effective testimony from women that conveys their experience of punishment by God, for the sin of aborting a child. But, we rarely see such testimonies today, by women or men for that matter, in most churches, primarily due to testimonies of that nature, not being politically correct or encouraged. However, this is not the first time, the distortion of the words of the Holy Bible, has been used to support an agenda, that is unconnected and foreign to its original intent, which is to spread the Word of the gospels of Jesus Christ. The Catholic Church chose to support slavery, by lending legitimacy to the practice in 1452, with a Papal Bull from Pope Nicholas V. A Papal Bull is a type of public decree, letters patent, or charter issued by a pope of the Roman Catholic Church. Historical references, when it comes to this issue state, in 1452 Pope Nicholas V issued a Papal Bull called Dum Diversas, which granted Portugal and Spain permission to invade, capture, chain and subjugate unbelievers and enemies of Christ, wherever they maybe to perpetual slavery. This was taken at the time to mean, because the Pope presented himself as God’s living ambassador on the earth – especially, when it came to the interpretation of the Bible – a full endorsement from the Lord our God of the righteousness of the enslavement of human beings. Slavery, as practiced in the United States, Central and South America and the Caribbean have no Biblical support at all; just as denying women the right to choose when it comes to committing the sin of abortion. The Pope did this, in spite of scripture in the Holy Bible, which he was aware of, that plainly forbade this practice. And now, we have Franklin Graham, using the fame and power associated with his father, Rev. Billy Graham, to support President Trump, the Republican Party and its agenda, in spite of Mr. Trump being an unrepentant liar and the Bible, stating, it doesn’t deny the right of women to choose, when it comes to sin. Pope Nicholas V, as I stated above knew the verse, relating to slavery, was in the Bible, just as Franklin Graham and his informed followers, know the above scriptures regarding a woman’s right to choose are in the Bible, also. Of course, Mr. Graham additionally, knows GOD’s position, when it comes to a liar. It is difficult to fathom the motives of Pope Nicholas V, and now, Franklin Graham and his callous misinformation campaign, when it comes to the truth of the Word of God. However, what is important to know, the words of the Bible conclusively, did not support Pope Nicholas V, in 1452 and does not support Mr. Graham and his followers, today. Abortion is a sin. And it is pointed out in the piece. So you clearly see, that God, does not take from a woman and anybody else, the ability to choose, when it comes to walking in His ways and following His commandments, statues, and judgments. I hope this helps you. The sin of distorting the Word of the Lord is serious and we as Christians should speak up when we see this happening, when it is within our power to do so, because of our love of GOD and His Word. was not sure if you are aware of the scripture Exodus 21.22. Many believe this is the Biblical prohibition against abortion.